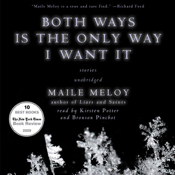 BOTH WAYS IS THE ONLY WAY I WANT IT by Maile Meloy (unabridged) is presented by Blackstone Audio and comes with what is perhaps the best audiobook app available (see FEATURES, below). Eleven new stories demonstrate the emotional power and assured style that have earned Meloy praise and devotion. Propelled by a great instinct for storytelling, this collection is about the battlefields in seemingly harmless spaces: kitchens, living rooms, cars. Set mostly in the American West, the stories feature small-town lawyers, ranchers, doctors, parents, and children exploring moral quandaries of love, family, and friendship. A ranch hand falls for a law-school graduate who appears unexpectedly in his remote Montana town. A man opens his door to find his dead grandmother standing on the steps. Two women weigh love and betrayal during an early snow. Meloy examines the tensions between having and wanting as her characters try to keep hold of opposing forces in their lives. NOTICE: This app includes the exact same 5-star recording offered elsewhere at much higher prices. It was professionally recorded by Blackstone Audio’s Audie®-winning narrator, Bronson Pinchot and Kirsten Potter. You are not buying yet another amateur or volunteer narration. No clicks, background noises, throat clearing, mispronunciations, tinny voices or monotones will be found here. •EXPERIENCE. About 5 hours of narration. Created as a Folium enhancedAudio™ edition, this book includes extra functions and features not found on lesser players. RATING: Suitable for adults who enjoy tales of love, life, and family.